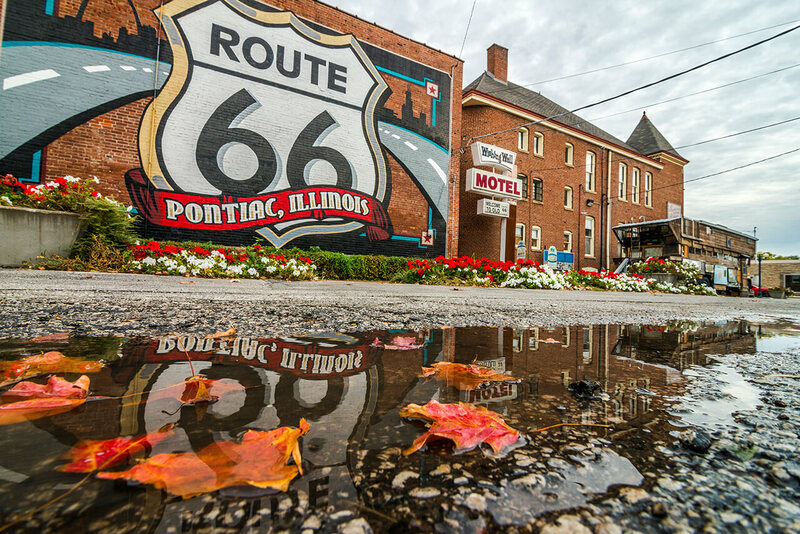 Few towns along Route 66 represent the Mother Road more magically than Pontiac, Illinois. Located in the lovely county of Livingston, the small town paints the perfect picture of middle America with its idyllic parks and swinging bridges that cross the Vermilion River. The town was even honored to be the chosen location for the 1984 film, Grandview, USA. One of the more devoted Route 66 locations, Pontiac draws visitors in from across the United States, and the world, to explore their quiet streets and incredible Route 66 Hall of Fame and Museum, Pontiac-Oakland Automobile Museum, and the amazing Livingston County War Museum, where you can speak with veterans and their friends and families in person. 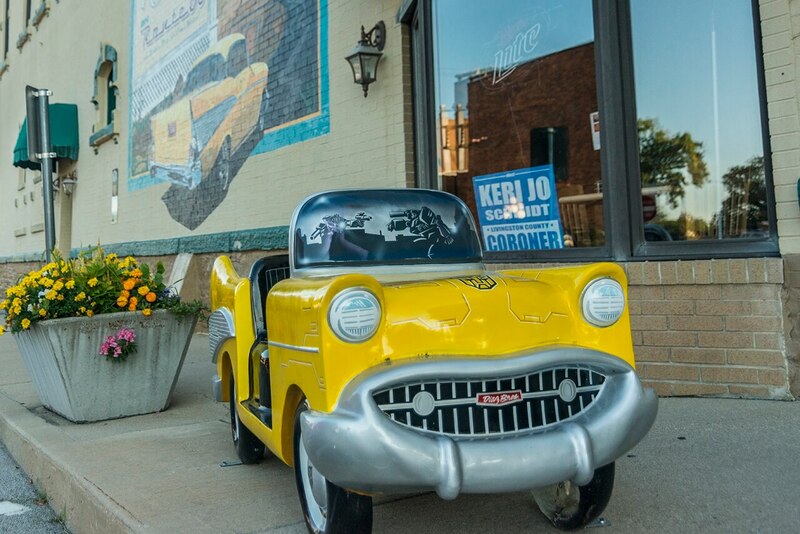 Also, just behind the Route 66 Hall of Fame and Museum stands the International Walldog Mural and Sign Art Museum, and the quaint streets are dotted with cute little vehicles that showcase the town’s passion for automobiles. There is something to see and do for everyone. But more than anything else, it is the peaceful, welcoming, vintage atmosphere that continues to draw people to Pontiac year after year. Cruise Night's in downtown Pontiac on the Courthouse Square, is home to the GTO Regional All Pontiac Car Show. 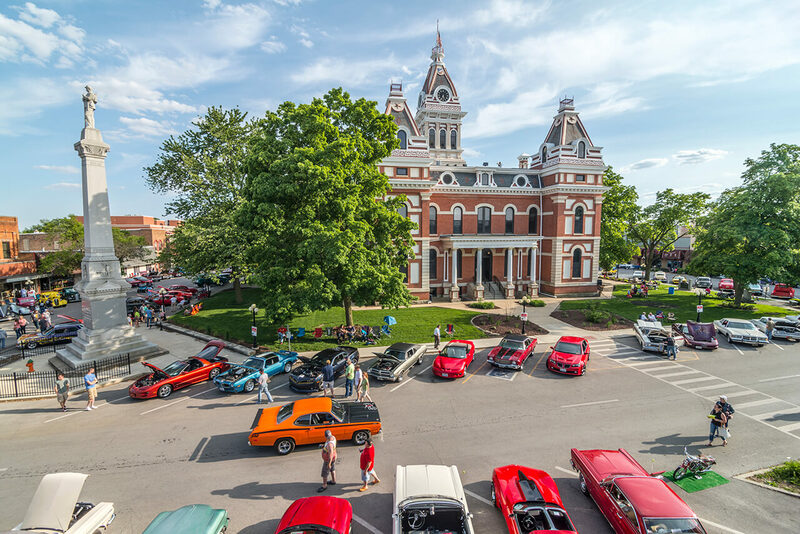 The unique character and beautiful scenery of Pontiac makes it a perfect location for car enthusiasts to participate in automobile events. I’m always looking for new angles to capture a different perspective of a familiar scene. For decades this historic red brick firehouse served the community of Pontiac. 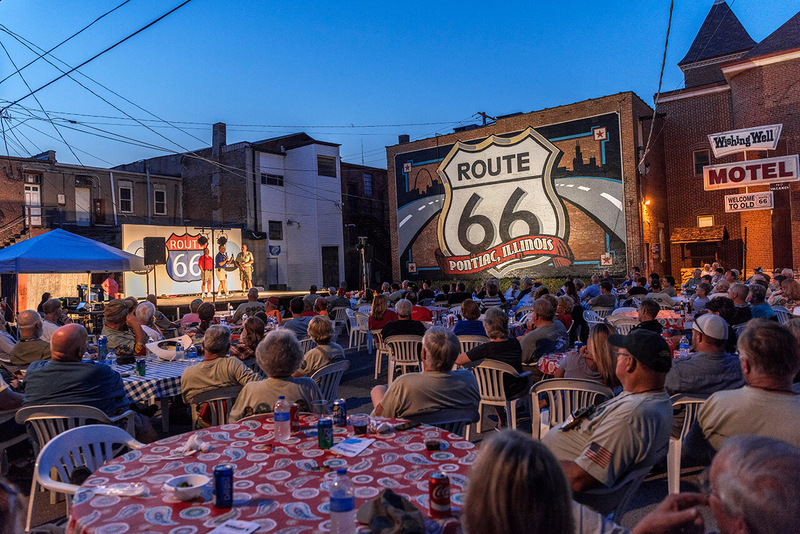 Today, as a time capsule where the spirit of Route 66 is preserved in expansive exhibits, Michael Campanelli's Route 66 photo journal, iconic folk artist Bob Waldmire's quirky home on the road, and the Route 66 Hall of Fame, it serves the international Route 66 community. This stunning mural at the rear of the museum is now one of the most photographed sites on Route 66. I’ve always been attracted by reflections, so when I saw the Route 66 shield in the water, I had to get down on the ground and lay on my stomach to capture this image. Members of the Military Preservation Association participate in festivities during the Route 66 91st Anniversary Convoy in downtown Pontiac. Becoming part of the crowd and not being noticed is very important to me when capturing scenes like this. 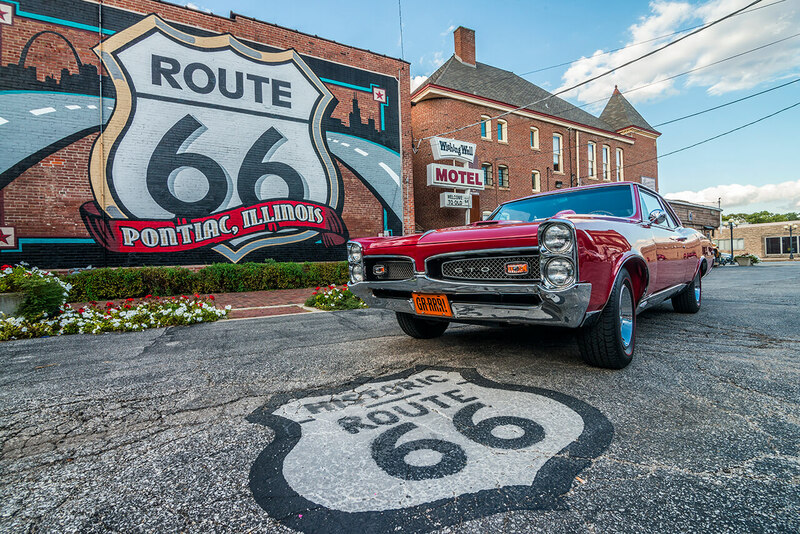 A 1966 Pontiac GTO is staged in front of the Route 66 Association Hall of Fame & Museum for a photo opportunity. When photographing cars on Route 66, I look for the best angles to bring out the finest features of the vehicles. 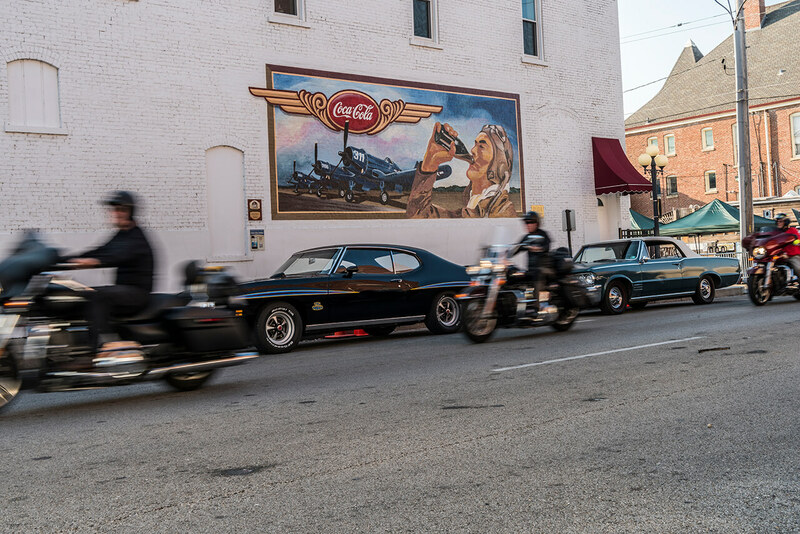 Motorcycle riders cruise downtown Pontiac, Illinois. When I capture riders on the road with my camera, I feel as if I was riding the motorcycles myself. A miniature 1957 Chevy Bel Air convertible has been decorated to resemble a transformer. The Pontiac Art Cars are a seasonal display, and are put into storage for the winter. My affection for cars started when I was a child and to this day I continue to be attracted by them.